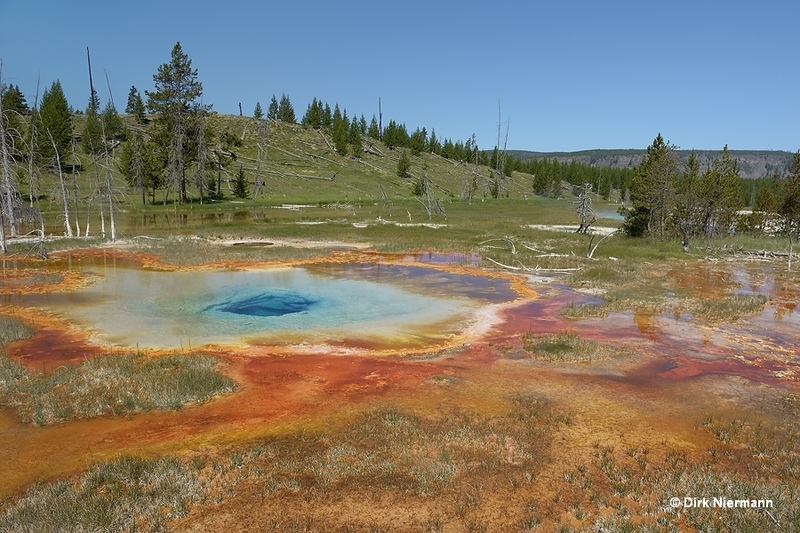 Just before the old road from Old Faithful bridges Firehole River and continues to Morning Glory Pool, the Chain Lakes Group occupies the meadow on the left hand side. First of all Culvert Geyser sits at the concrete reinforced edge of the road. Its appearance is a result of the road work, and there are good reasons to assume that it would not only look differently but also would show up on a different location if the road were not built. Culvert Geyser's small eruptions ceased in 1988 and it is dormant since then. 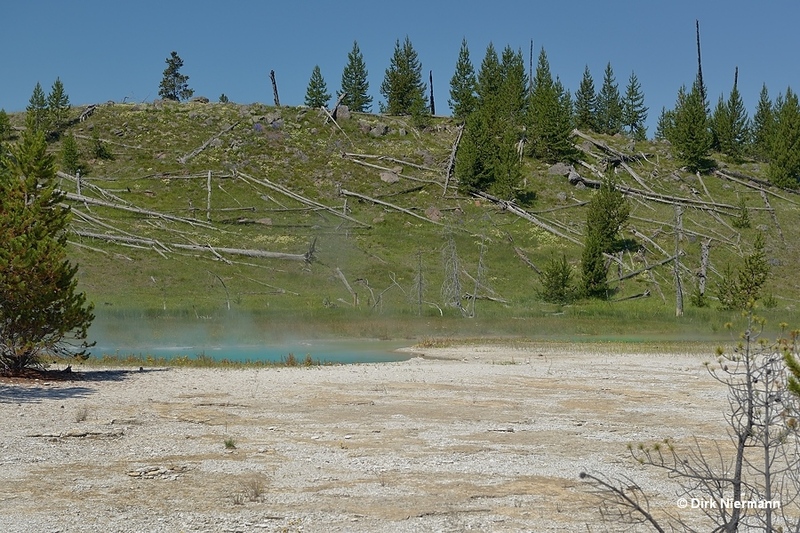 From 2014 onwards the geyser has been fenced off at larger distance, so photos like the one below are no longer possible. 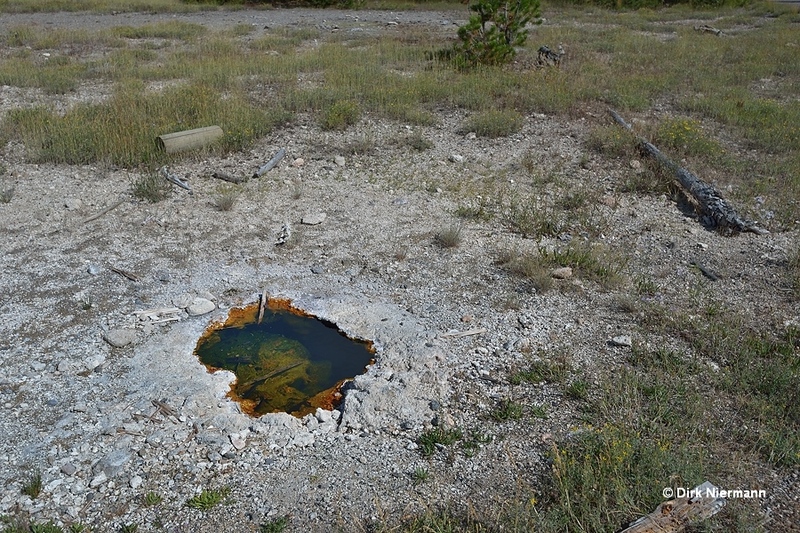 Persistent Spring, a few feet south, is probably fed by the same buried hot water source as Culvert Geyser. Once it was a perpetual spouter, but now activity is reduced to slight corrugations on the surface. Beyond Persistent and Culvert the nicely colored Square Spring occasionally splashes during overflow. Across the trail from Culvert Geyser the inconspicuous vent of Victory Geyser shows up. 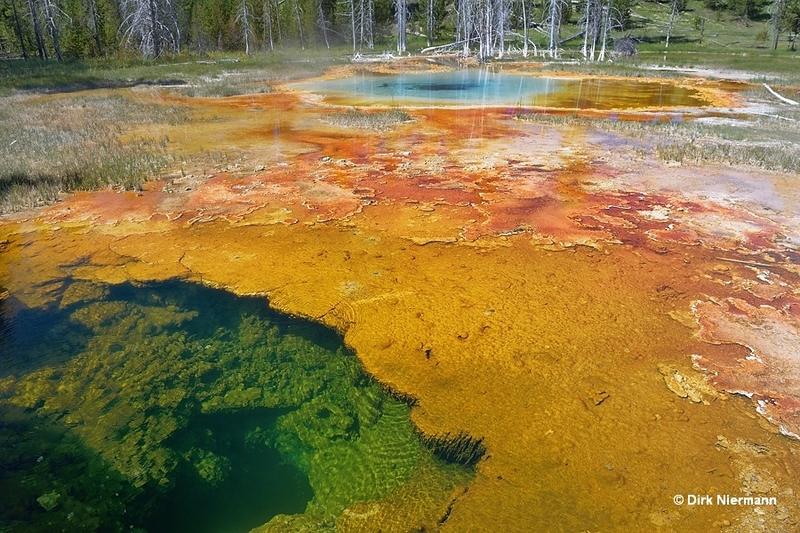 It was active from 1998 to 2000 and darted water up to 2 m (7 feet) high into the air. All features of the Chain Lakes Group farther northwest lie on slightly elevated ground and therefore they are hard to spot from the road. The next picture shows Bottomless Pit, a quiet blue pool, on the left side. Right beyond Bottomless Pit the small spring UCLCNN009 can be detected. On the right hand side lies Middle Chain Lake. 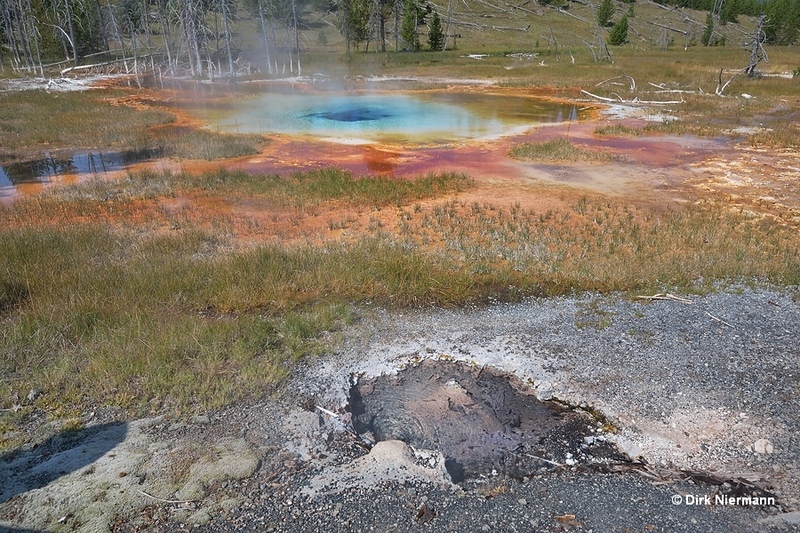 Just like the features before, also the pool of Link Geyser is difficult to see, even though it is located at closer distance to the road some feet northeast of Bottomless Pit. Minor eruptions up to 1 m (4 feet) height are frequent, whereas major eruptions, reaching up to 23 m (75 feet), are very rare.